Like much of the rest of the United States, America’s farms are controlled by aging white men. Of the two million or so principal farm operators across the country, just 6% are under the age of 35, over 90% are white, and over 85% are men according to the most recent USDA data. Yet over the past few years, people of color have increasingly returned to farming; in the five years leading up to 2012, the number of non-white farmers increased by about 15%. And the share of farms operated by women has nearly tripled over the past 30 years. In order to create a more sustainable and equitable more food system, this influx of diverse farmers needs to continue. 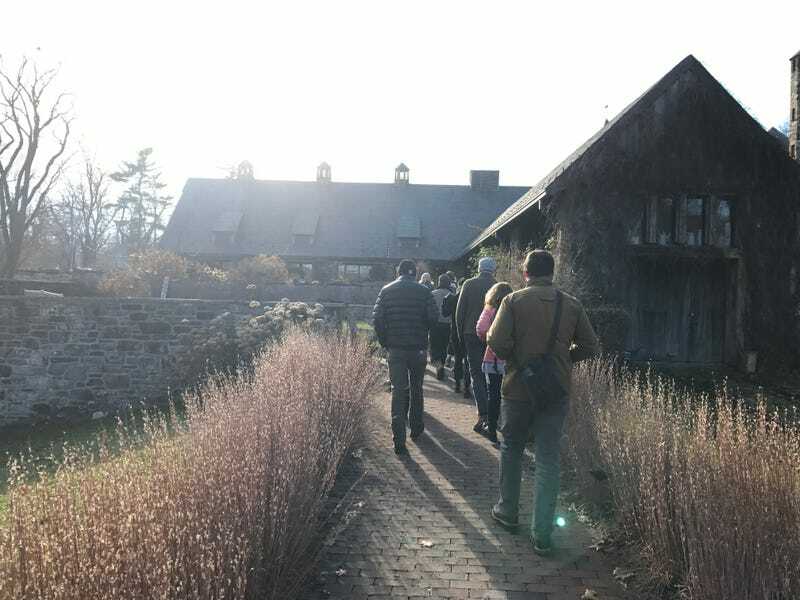 The Young Farmers Conference hosted by the Stone Barns Center for Food and Agriculture is focused on precisely this issue: supporting the next generation of diverse, sustainable farmers. At the conference in December, I asked six of them to explain why they decided to dedicate their lives to the soil, what makes them hopeful about the future of food in America, and what keeps them up at night. Yemi Amu, 36, runs an aquaponics farm in Bushwick, Brooklyn. Before farming, Amu worked as a nutrition educator with low-income individuals, where she realized that the biggest barrier to improving eating habits wasn’t education but simply access to healthy and affordable food. She started farming as a way to provide fresh produce to her clients. What makes you wake up in the morning and want to farm? My farm is squeezed between a liquor store and a tobacco shop…people are getting drunk and falling out on one side, people are getting high on the other side, and then in the middle you have a farm…there’s such an impact in having a space like that where the population density is so high, to be able to walk into a garden and say that’s a carrot, that’s kale, that’s lettuce…And it’s more than just how much food you can grow, it’s also the environmental impact. When you have a kid that walks into your farm and is excited to eat the carrot or the kale that is growing, that child is going to grow up to be a policy maker one day, to help make change…In short, I farm because I would like fresh food and healthy food to be as accessible as doughnuts and junk food. What worries you about the future of farming in America? I’m a farmer that got into this to make fresh food accessible, but I still have to sell my produce really expensively in order to make a living. That worries me…I’m worried that even though I see the future of farming and healthy food as being accessible to everyone, it’s going in the opposite direction, because people are not being paid livable wages, and they can’t afford good food…I’m worried that when young people come to my farm and say, “this is really cool, how can I do this for a living?” I tell them, “don’t.” I tell them to consider other options…because what I do not want is for them to grow up impoverished. Davon Goodwin, 28, owns and operates a diversified farm in Raeford, North Carolina. Goodwin came to farming after he returned from a tour of duty in Afghanistan, where he suffered significant head injuries that made it difficult for him to find traditional work. He started volunteering on farms and soon enough owned his own land. Where do you see the future of food in America heading? I see it going downhill real quick. If you don’t get a resurgence of young farmers before this last generation of old farmers die out, then what’s next? What does it look like? To me, it looks like hell…less affordable food, a bigger hunger gap…the barriers to getting into farming are to big for most young people: capital, land, equipment, knowledge…Even though the USDA has programs for young farmers, it’s not enough. It’s really simple: the more you let farming be accessible to people, the more young people will go into farming. What’s it like being a black farmer in the south? It’s different being a black farmer in the south. I get flack from both sides: African-Americans look at me and say “why would you want to farm; why would you want to do this? We struggled for all these years farming, and now you want to farm?” And then, from whites, you get the power struggle. Land is very powerful, and it’s never really been in the hands of African-Americans on the large scale…and we haven’t gotten to the point where it’s sociable to be a black farm owner. Right now, it’s heavily white male dominated, and that’s a struggle for me looking for land to expand my farm, because many white people don’t want to sell their land to a black man. The struggle is real. Adrian Galbraith-Paul, 26, runs a nonprofit organic farm outside of Philadelphia. He views farming as a way to provide jobs and food for people in communities that often lack both. What direction do you think the food system in the U.S. is moving? I think there’s pulls in two major directions. There’s certainly a very strong organic, sustainable movement, among young farmers that want to make change. And there’s also the agribusiness pull, which is always getting stronger and adapting. We’ve certainly seen a rise in organic agribusiness agriculture, which might seem good but is basically taking the same practices that have polluted our river ways and our air and have led to the destruction of the family farm, and now they’re just of putting in organic inputs and calling it organic agriculture. It’s sort of one and the same as the traditional, industrial agriculture…we’re at a crossroads with our food system. But I guess we’re always at a crossroads. What needs to change for our food system to become both more sustainable and affordable? I think we need more farmers. It’s a numbers game: one person can only grow so much food, and so if you really want to change how our food is produced, to have a system that is better for the environment, employs more people, and feeds Americans healthy food then you need to have more farmers. And to do that you need to break the stereotype of what it means to be a farmer: parents want their children to grow up to be doctors and lawyers. No parent wants their child to grow up to be a farmer. That needs to change. Leah Penniman, 36, fell into farming by chance when she found a job working for a food justice organization in Boston. She now operates Soul Fire Farm in upstate New York, a production and education farm focused on food justice and ending racism in farming. Soul Fire Farm also provides fresh produce to about 100 families in nearby cities. Why do you think we have so few people of color farming in America? As African-heritage people, we have inherited trauma from our ancestors who were enslaved and forced to work as tenant farmers. This trauma causes us to confuse the land herself with the oppressive people and institutions that have degraded our humanity. This manifests when folks come to the farm and say “I don’t do stoop work” or hesitate to get out of the van, preferring the comfortable familiarity of upholstered seats to the unfamiliar, uneven ground. Many of our ancestors worked very hard to get OFF of land and into the urban professional dream, so tilling the land is seen as a step backwards… Young people need to touch the earth with their skin, be listened to by her, feel their own power as creators and producers. That is part of their healing. What direction do you believe that the food system in the U.S. is heading? That’s up to us. White supremacist corporate capitalism would like the food system to continue in the direction of pillage of the earth, exploitation of farmworkers, land grabbing, pollinator extinction, climate change…Those of us on the frontlines would like the food system to move in the direction of improved working conditions for farmers, enhanced agro-biodiversity, universal access to life-giving food, public support for the ecosystem services guarded by sustainable farmers…It is entirely up to us to determine the direction of the food system. Willie Bradford, 24, runs a cattle farm in Charleston, Mississippi. He started farming at 16 when he got a grant from the USDA to buy a few cattle. Now he owns about 40 heads of cattle. What is it like to be a young black farmer in the South? Well, it’s kind of a funny thing, in my area I don’t know another black farmer my age in probably the next—well I don’t know another black farmer in Mississippi. Honestly…I think one of the biggest barriers stopping young black people getting into farming is the thought of farming. People my color see a farmer and they think slavery. I try to tell them that it’s different now. There’s a lot of opportunity to be a small business owner, to feed your community, and do a lot of great things. What worries you about the future of farming? The thought of growing my farm. Not really having the resources, but having the goal and the mind that I want to be big. It’s a lot financially, and that’s something I’m hesitant about, and scared of. But one of the things that I try to strive on, is that I try not to worry about things I can’t control. That’s how I get up in the morning and that’s how I go to bed at night. I only worry about what’s in front of me. Anna Andersson, 24, grew up in North Dakota surrounded by massive fields of wheat. She now lives southern Sweden, where she works on a small organic farm. How did you come to organic farming? Growing up in the environment that I did, in North Dakoda in the Midwest, there is definitely a dominant agriculture, which is conventional agriculture…it was all around me and shaped my perception of what agriculture was, but at the same time I never ate any of the food from the many acres of fields that I was driving through and growing up in. I was also aware of an alternative form of agriculture, through my grandfather’s farm in Sweden. And I was able to compare these two approaches, which both fall under agriculture, but have such different values. For example: how nitrogen was being put into the fields in the form of manure in one scenario and in the form of liquid fertilizer in the other…I saw how alternative agriculture could be a better way to grow food. What role can farmers play in helping to change our food system? There is a huge importance in weaving narrative into the food that we’re eating, and rejecting the anonymity that we experience with our food. And as farmers, we have a chance to be storytellers, of the land that we’re growing this food on, how it’s being grown, and how it’s connecting the communities around us…I’m hopeful that we’ll see an agriculture system that becomes more diverse, in every sense of the word. Diverse in the sense of the crops that are grown, and diverse in the sense of the people that are becoming farmers, from many types of backgrounds and education.